This year, simultaneous events will be taking place in Paris and Amsterdam, through the Decoloniality Europe network. Watch the London event live on www.ihrc.tv from 3pm GMT. Download the programme of the event here or at the end of the page. Each panel with have a Q&A and you can send us your questions via Twitter @ihrc or using #GMD2014. Post your questions on our Facebook Page, or email on gmd[AT]ihrc.org. Michel Warschawski, founder of the anti-Zionist Alternative Information Centre and a founder and leader of the pioneering anti-Zionist socialist organization Matzpen. Warschawski will outline the dehumanisation of the Palestinians that has been a necessary precondition of their oppression. Tjanara Goreng Goreng is an Assistant Professor of Indigenous Studies based at the University of Canberra and will be speaking on the Genocide of the native people of Australia. Sibtain Panjwani will look at the Quranic view on the development of nations and communities. There will be a screening of the short film, ‘Visiting the Genocide’ by Assed Baig that follows the 2012 GMD Poetry Competition winner Frano Vainio-Doiseul on his journey to Bosnia. Frano’s winning poem will be read by artist Alaa Kassim who will also introduce this year’s competion for ages 11 – 18. Rapper Marcel Cartier will perform his piece Nakba (Free Palestine). As usual a list of genocides wil be read out followed by one minute’s silence. There will be skype / video link ups with the Paris and Amsterdam events during the London programme. What is genocide? Or rather, what historically and politically constructed representation of genocide? It is with this question that the NAO, the PIR, the Frantz Fanon Foundation and Uhuru will address. This meeting seeks to keep alive the memory of colonial crimes and genocide, the slave trade and slavery, which have been hidden and perpetrated by the “civilized nations”. In the Netherlands, the GMD part of a meeting of activists on the fight against racism and Black Peter. The meeting is an initiative of three activists: Kenneth Danube, editor Slavery Online, Mitchell Esaias, president New Urban Collective and Sandew Hira, director IISR. The meeting has three purposes: First, to promote the unity of the anti-racism movement. We will provide the opportunity to discuss how we should respect each other’s views on people with different views together: what divides us and what unites us, we can develop a common agenda. Second, the international community Involving Europe in the fight against racism in the Netherlands. 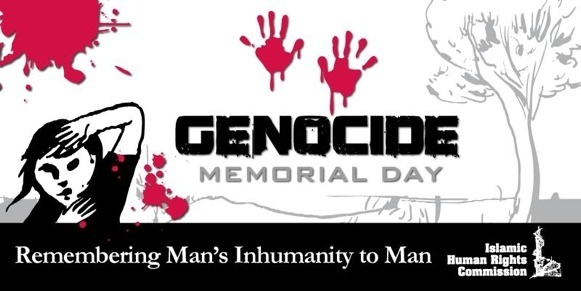 We will have a skype liaise with London and Paris where activists in those countries holding Genocide Memorial Day. Thirdly, the celebration of a year Slavery Online. This community has now become the place on the Internet where you can find about the legacy of the Dutch slavery everything. How can we share knowledge with each other in 2014? Inaugurated by the IHRC five years ago as an inclusive event, GMD aims to highlight and help prevent genocidal actions all around the world, irrespective of race, ethnicity or religion. GMD rejects the notion that there is a hierarchy of victims depending on their background. It seeks to hold people accountable by highlighting those people and power structures responsible for perpetrating genocidal acts and by remembering the victims. Read the case for GMD in ‘Beyond a hierarchy of victimhood: The Case for Gencoide Memorial Day’ by Adam Majeed. You can find more information of and archives of previous events on the Genocide Memorial Day site.